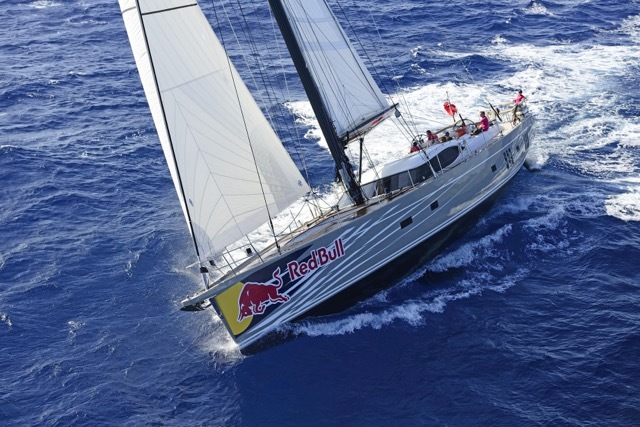 So, what’s the Red Bull logo on the bow of LUSH all about? It is highly unusual to have a big logo on a luxury yacht, that type of thing is reserved for the yacht racing gang. But, if you know Eddie Jordan you’ll understand he’s not the type of guy to conform to the norm and blend in with the crowd, even in the superyacht world! When the opportunity presented itself for him to have a Red Bull logo on the bow and in doing so support a super groundbreaking charity, Eddie jumped at the chance. In short, Red Bull sponsored LUSH and all the proceeds of the sponsorship were forwarded, in their entirety, to the not-for profit international research foundation Wings for Life. Wings for Life is a Spinal Cord Research Foundation dedicated to finding a cure for spinal cord injury. Founded in 2004 by Red Bull CEO Dietrich Mateschitz and the two-time motocross world champion Heinz Kinigadner, Wings for Life funds world-class scientific research and clinical trials around the globe aimed at healing the injured spinal cord. Advancement in spinal cord research is mainly based on private initiatives and public donations. It doesn’t get governmental support or funding from pharmaceutical companies, as the injury is not considered a widespread enough condition. 100% of all donations to Wings for Life are used for research purposes with all administrative costs kindly covered by the Red Bull Company. Contrary to common opinion there is legitimate reason to hope that spinal cord injury can be cured and it has been proven that nerve cells in the spinal cord are capable of regeneration after certain types of treatment. It was an absolute honour to have Anita Gerhardter, the CEO of this fantastic foundation, onboard LUSH at the start of the World Rally and again recently when Paul & I rejoined the boat for the St Barths Bucket. Anita is unbelievably passionate about Wings for Life and its vision for curing spinal cord injury. Every year, at least 250,000 people sustain a spinal cord injury, followed by paralysis. Millions of people are currently dependant on a wheelchair after injury. Anita and her team envision different future for these people, they believe that spinal cord injury will be curable one day! Wow! What a statement and what a mission! So far Wings for Life has funded 110 spinal cord research projects worldwide at renowned universities and institutes. Tomorrow, on May 3rd, they are holding a massive fundraising event with 35 countries hosting the Wings for Life World Run. 100% of the funds raised will go to life changing research projects aimed at healing the injured spinal cord and Red Bull will be covering all the administrative costs. If you’re interested to learn more about this event and Wings for Life please click here http://www.wingsforlifeworldrun.com and help make the diagnosis of paraplegia a thing of the past.